What in the world is wrong with Sidney Crosby? The Pittsburgh Penguins' superstar is not playing like himself in this postseason and it is extremely noticeable. Crosby has one goal in 12 playoff games this postseason and only has 10 goals in his last 40 games overall. Crosby has just seven points in 12 playoff games, and has gone without a point in five of the 12 playoff games this postseason, including two straight heading into Tuesday night's game seven. So why is Crosby not playing like the Sidney Crosby we all know and have come to expect? Perhaps fatigue is the biggest reason. Tuesday night will be Crosby's 93rd game overall this season and that is not including the six games he played in the Olympics. Take into consideration that Crosby only played in 50 total games last year due to the playoffs, and only 28 total games in 2011-2012. Crosby is no doubt fatigued, but there has to more than just fatigue playing into this. But wait....People are coming through with some truly awesome rumors. Perhaps the most bizarre rumor going around is people saying that Crosby is having trouble with his girlfriend, supermodel Kathy Leutner. Take this rumor with a grain of salt. 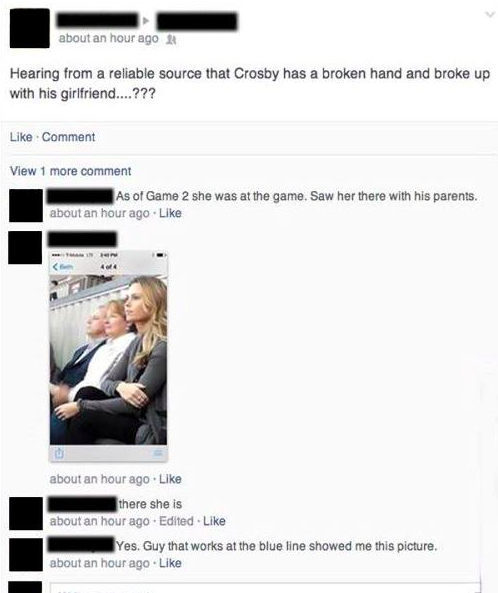 There is no legitimate source for this, but I can tell you that more than just a hand-full of people have said that Crosby and Kathy are going through some issues and that Crosby isn't in a good place mentally and it has to do with Kathy. I have nothing to back this up with. Just know that there are multiple people saying this. This is Kathy: A friend told us that "She is horrible". Whatever that means. Kathy is hot enough to start wars. Crosby is a big superstar but women can make guys do weird things, especially really hot models. I hope this is just a minor distraction for Crosby at the least, and not a real reason he is playing bad. Other people are claiming that Crosby has a broken hand and/or wrist. That would not be surprising considering Crosby's reluctance to shoot the puck and his lack of production. Crosby had 3.16 shot per game in the regular season and three shot per game in the playoffs. It is a small drop, but he is shooting less and a bad wrist/hand would be a good reason. The truth is, we might never know if any of this is true. One thing for sure is Crosby is not himself and you can easily see how frustrated he is on the ice. 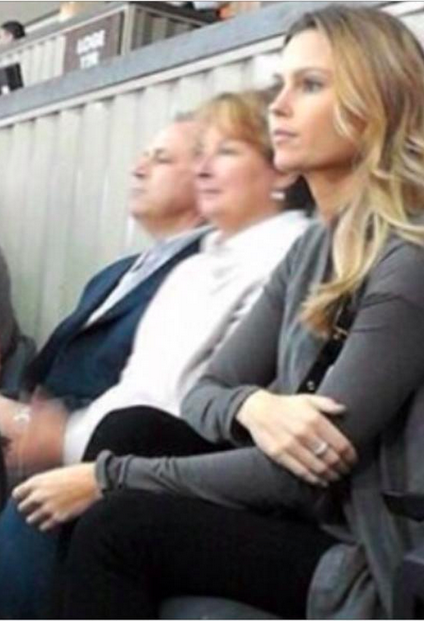 So while you at it, can you add Melanie Collins to the list of problems for James Neal too? Supermodel?! She models for fitness, and bridal magazines, and does a few ads for clothing companies. She doesn't do high end work, like catwalk modeling or Vogue, and this is FAR form being a supermodel. She's a regular model, that's all. Crosby isn't playing right... Must be a woman's fault. Has nothing to do with Crosby, himself. We haven't won the Cup in going on 5 years, must be some other model's fault somewhere.